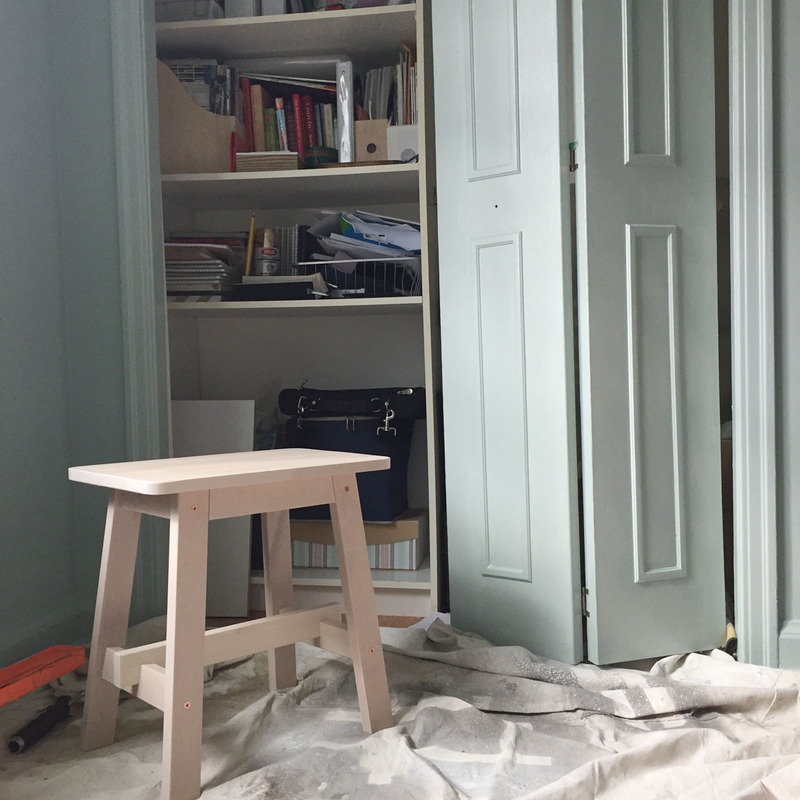 If it feels like projects around here are taking a long time, that's because they are. Maybe it's because we're older and our bones ache a bit more. Maybe we're just relishing the process, knowing that we'll be in this house for a long time. Or it could be I'm distracted... I do have paint swatches up in EVERY room and am finding it a challenge to just buckle down and focus on one thing, ha! I shared the plan for this office renovation a while ago and I finally have something to show for it. First step was to paint. Since I'm going to be spending a lot of time in this office, I wanted something that was calming, a colour that I enjoyed and felt could let my mind wander and be creative. For me, those colours have always been the blues and teals. Tranquility by Benjamin Moore was the winner. Because of that ridiculous rounded corner feature, it was simpler to paint everything in one colour. I decided to paint out the baseboards, window trim, and closet doors in the same colour as well in order to have fewer visual distractions. I used Matte finish on the walls (LOVE this finish and its deep saturation of colour) and Pearl finish for the trim and doors. 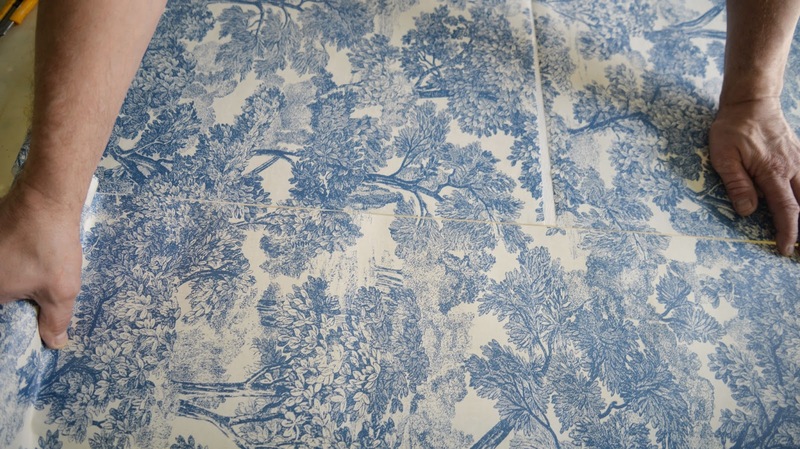 Now the wallpaper that was going in this room has navy blue and typically you'd pick a wall colour in the same tone. I just knew that I couldn't work in a room with navy walls and ceiling so I went with what felt right. I think that's my approach with this house... forget the rules and do what works for us. One of you kind readers helpfully suggested that we prime the back wall, so that the original yellow paint wouldn't show beneath the wallpaper. Great idea! We did that and also figured out the placement and drilled holes for the future shelf brackets. We definitely didn't want to be trying to figure out the shelving layout after the wallpaper had gone up! I also had Sean hang our old bedroom chandelier in here to test it out. I actually like how it looks with the wallpaper but sadly it doesn't cast enough light so I'll have to find something else. Two sconces are also going up above the shelving. Exciting! And then there was the wallpaper. I've been dreading this part of the project mainly because we've never installed wallpaper ourselves before. But I shouldn't have worried - installation went very easily! The first step (which I didn't take a photo of) was to measure from the starting corner over one width of the wallpaper less 2" and draw a level line. This would allow our first panel to overlap onto the left side wall and we could just cut off the excess. We decided to hang the second panel first (ie. the level line was against the left leading edge of the wallpaper) so we could have a full panel to work from. We measured the height of the wall and added 4" to have some overlap at the top and bottom trim. We cut the panel to this size. Unfold the top half of the panel and apply it to the wall. Ensure there is an overlap at the ceiling or trim. Slide the paper in place so it lines up with your level line. 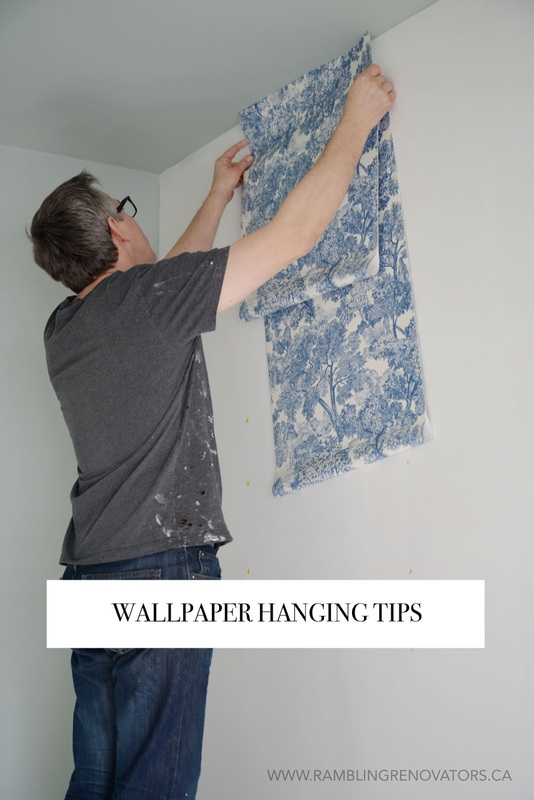 Unfold the rest of the wallpaper and ensure it's fully level. Working from the centre out towards the edges, use your plastic smoothing tool to push out any air bubbles. 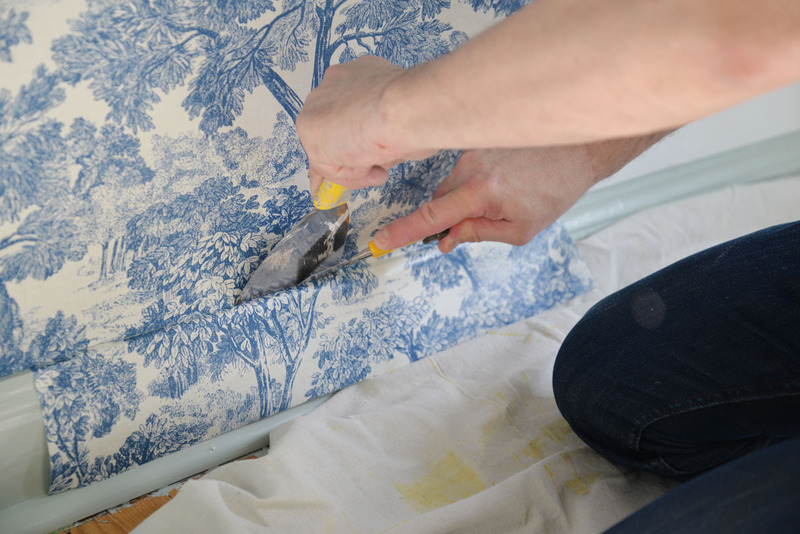 Use a damp sponge and clean water to wipe off any excess paste on the face and edges of the wallpaper. 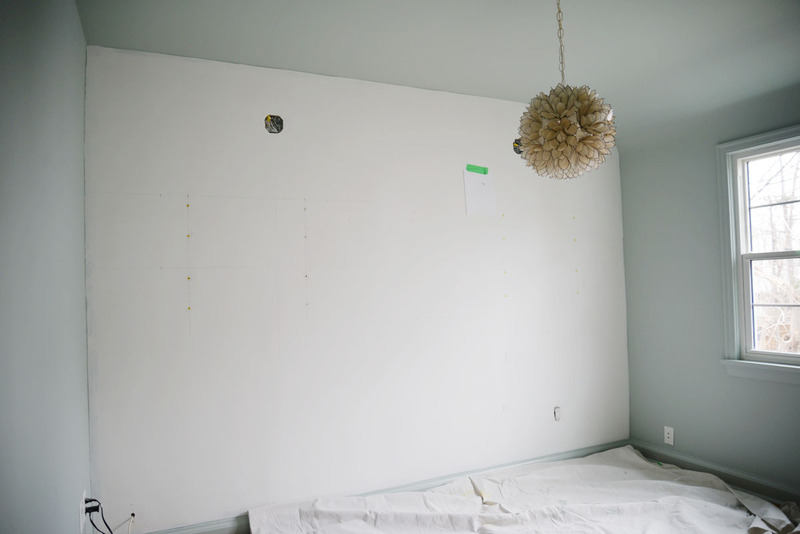 Using a metal putty knife as a guide, trim the excess wallpaper at the ceiling and baseboard. Use a sharp utility knife to make your cut and change your blade regularly. We changed the blade after every three panels; a sharp blade ensures you don't pull or snag your wallpaper. 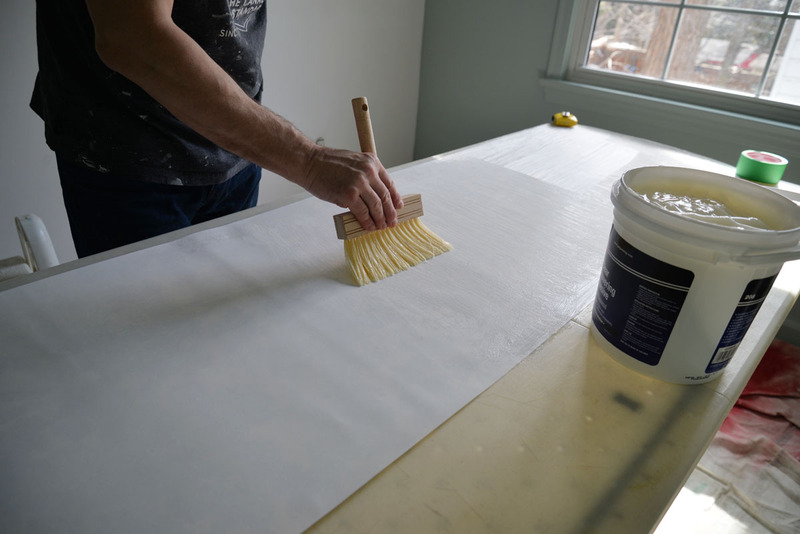 Tip: Keep your putty knife against wallpaper and cut with your utility knife on the outside or "waste" side. This way, if your knife slips, you won't score and slice your wallpaper. Repeat steps 2-7 for each panel. TIP: While your first panel is "booking", measure for your next panel. Match up the pattern, allow for a 2" top overlap and cut the top edge. Measure a length equal to the height of your wall plus another 2" for the bottom overlap. Cut the bottom edge. Move the first booked panel to a clean area then apply the paste and book the second panel. When the first panel is ready to be installed, the second panel can be booking. This significantly cuts down the wait time in between panels. I have to say that installing the wallpaper went very easy. 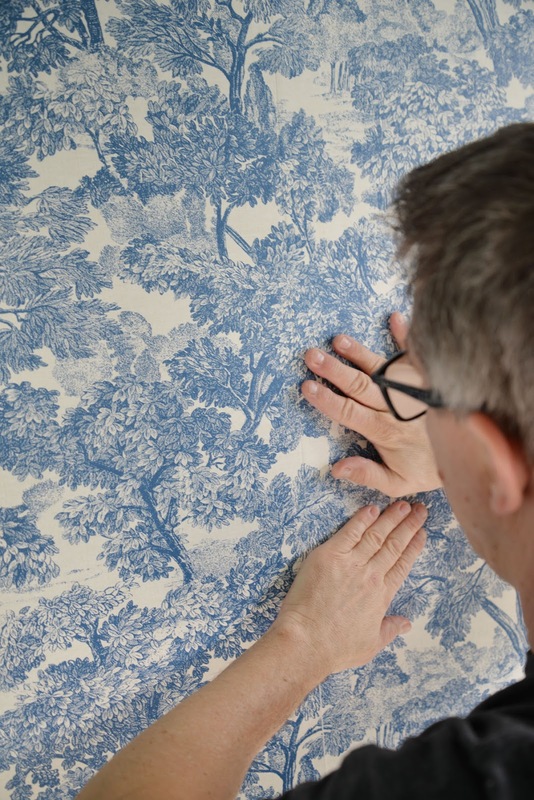 It went quickly with two of us to measure and cut the wallpaper, and by following the tip above. 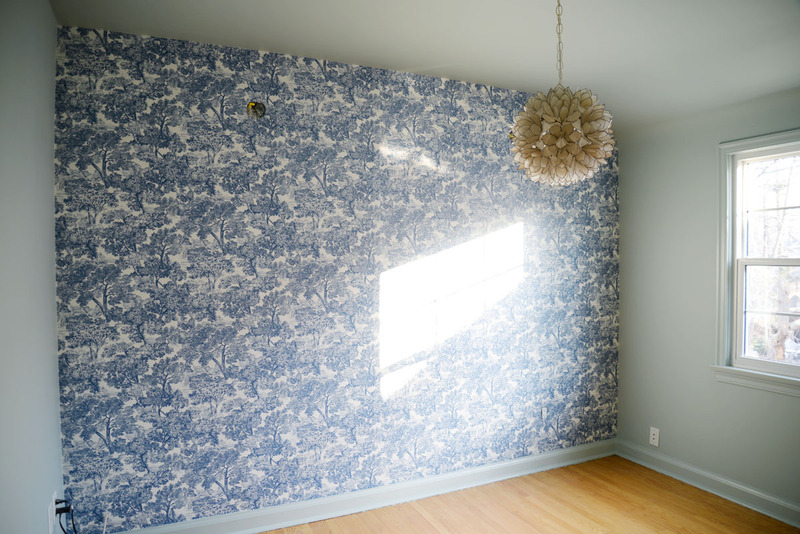 It was even easier than installing the temporary wallpaper we had in our last living room. 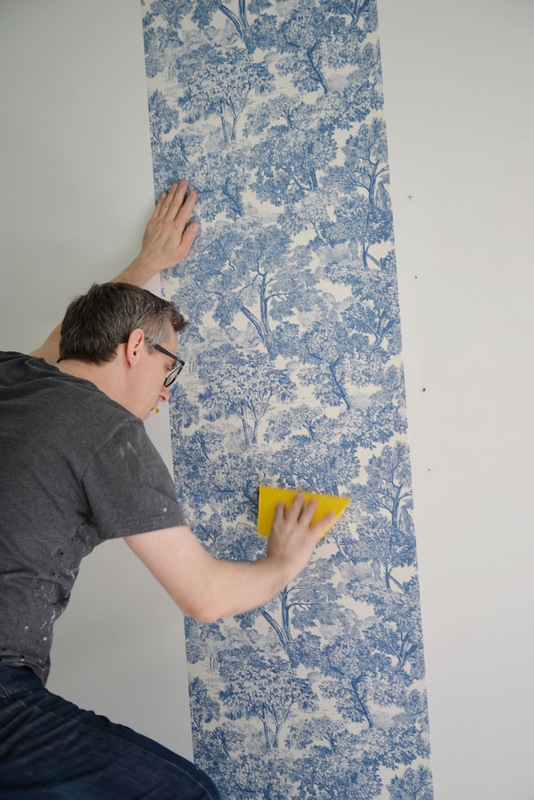 Temporary wallpaper can be frustrating as it constantly gets stuck on itself and you need to be careful not to stretch or tear it when you pull it apart. 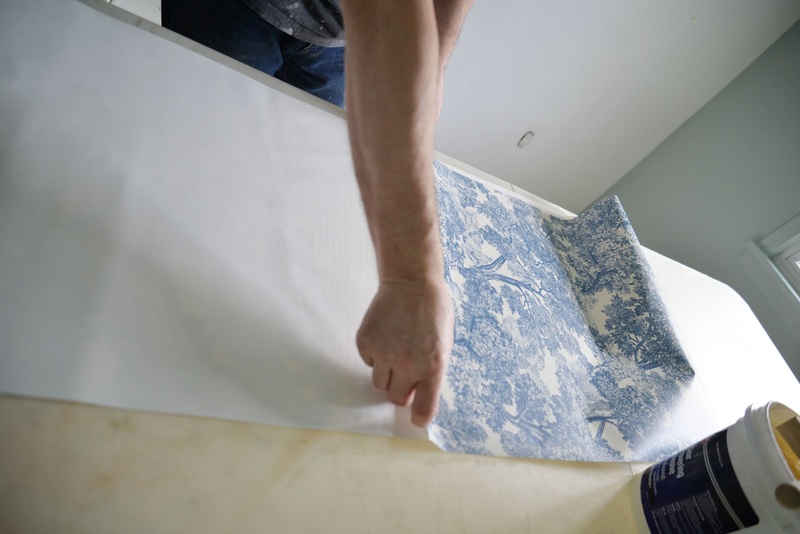 "Real" wallpaper, on the other hand, has a slower drying time so you have plenty of opportunity to shift and push the paper in place. The booking process also keeps things from getting too messy; the booked ends stay stuck together until you unfurl them one at a time. I'm thrilled that the difficult part of this room renovation is done. It's just in time too because my new venture launches today! That really was the motivation for this project - to have a space to dream, create, and build something new. Exciting times ahead! Hop on over to storyhouseco.com to see what else I'm up to. Disclosure: Thank you to Brewster Home Fashions and Benjamin Moore for providing materials for this project.